I am happy to share the ghost, moon and star appliqués. You can download them below. 1. Press your background fabric. Decide how you want them placed and pin in place. Starch your rectangles and squares. 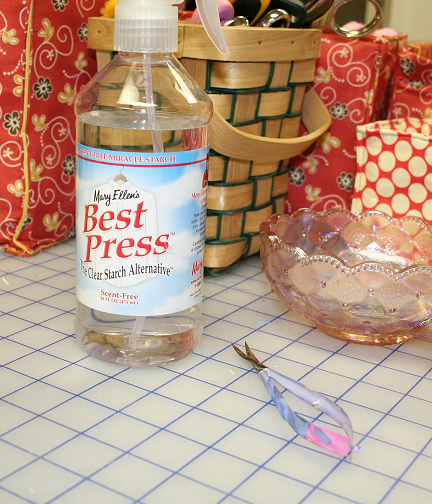 We like Best Press starch alternative. 2. Hoop a rectangle of stabilizer and the background fabric centering the first ghost template in the hoop. Remove the template. 3. For best results use a bobbin with the same color thread as you will be using for the third color. Embroider the first color. 4. Slide a rectangle of white fabric over the embroidered outline making sure the stitches are completely covered. (You can adhere the corners with Lapel Stick if you desire but since we had starched the fabric we didn't.) Sew the second color. 5. Carefully remove the hoop and lay on a flat surface. 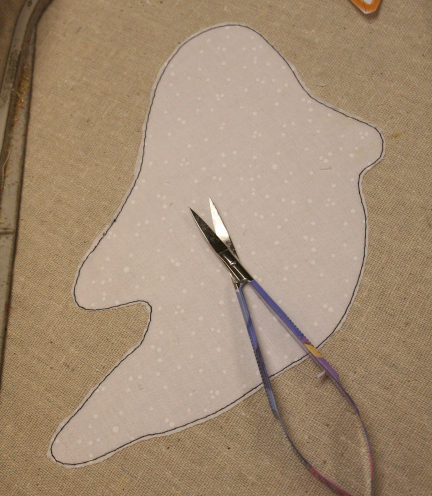 Using the appliqué snips trim closely around the outside of the stitching. 6. Place the hoop back on the machine and embroider the third thread color. 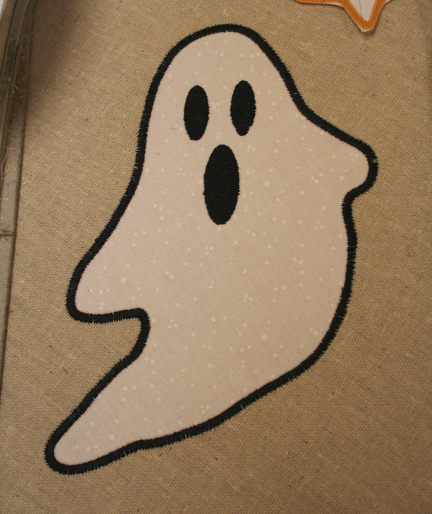 Sew the ghost eyes using the same color as you used for the third color. Remove from the hoop and remove the excess stabilizer from the back. 7. Repeat these steps for each appliqué. 8. 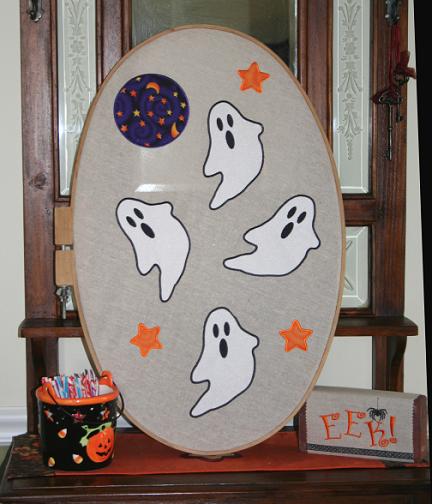 Secure your finished Ghost layout in the frame of your choice and add to your Halloween display. If you love to quilt, and have the time, these designs would make a cute Halloween door quilt. Or use them to add a Halloween touch to snack bags (see this blog), pillows or a runner. Add the free BOO from this blog or the free spider from this one. Whatever you do with them please share your creation in the Annthegran gallery. We have one more addition to make - pumpkin wraps each with one word TRICK OR TREAT. We will just create the words in Alphabet Xpress and sew them on strips of fabric. Pink around the strips and pin around the pumpkins. That should complete her fireplace décor before the gathering. Now we just need a little spare time to get this last bit sewn. Freestanding Sunflower (AccuQuilt Applique + Texture Magic) What’s in a name?